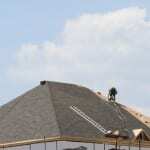 We offer affordable commercial roof repair services in Orillia, ON. Over the years, materials and techniques for roofing have improved, but many things can still happen that can result in your property needing commercial roof repair. Sometimes that is due to the general age of your roof, while other times, there is another reason. At Slippery Slope Roofing, we offer affordable commercial roof repair to get your Orillia, ON commercial roof back to doing what it was designed to do – keep you dry and comfortable. One of the benefits that you gain by calling us is our integrity. We will always give you the honest truth about the condition of your roof, so you can make the informed decision about whether to proceed with another commercial roof repair or consider replacement instead. We’ll also give you an educated assessment about the projected lifespan of your roof, so you can plan ahead for the replacement expenditure. One of the things that sets us apart from other commercial roof repair companies is our dedication to the minimal disruption to your business. That means we put all the manpower necessary on your commercial roof repair, so the job is done as quickly as possible. We also maintain a clean site, so your customers do not see a mess or are endangered by debris or materials. We also make sure to do the job right the first time. We take these extra steps to ensure your profits are not compromised. If you are experiencing some leaks, or you just want to find out how healthy your roof is, give us a call. We will be glad to inspect your roof and provide you with an estimate for commercial roof repair if it is necessary. At Slippery Slope Roofing, we offer high-quality commercial roof repair services in Orillia, Barrie, Bradford, Alliston, Newmarket, Midhurst, Cookstown, Beeton, Innisfil, Angus, Collingwood, Wasaga Beach, Oro-Medonte, Midland, New Tecumseth, Clearview, Bradford, Essa, Stayner, Springwater, and surrounding areas of Ontario.